Bicycle S&S coupler extreme lubrication tests performed by S&S Machine led me to SFR and their additives. S&S tested an SFR product and it proved to be the only lubricant of hundreds that met their anti-galling standard based on their test results of Dupont's 100% Teflon and 100% Krytox lubricants. Nothing else has ever come close! My thought was that if this product has the same lubricating properties and performed the same in this application as lubricants designed by NASA for the space shuttle, then imagine the reduced friction and increased life one should get out of bicycle chains, bearings, cars, trucks, and RV's. When researching SFR further, it was quickly apparent that major Fortune 500 Companies (GM, Ford, Honda, Flying J in their transport trucks, Coca-Cola, Budweiser, Abbot Labs, etc.) and various Governments around the world use SFR Products to reduce friction, increase longevity, increase fuel mileage, permit cooler running, all of which end the end save large sums of money. SFR, clearly the leader in the field of oil additives, supplies several private label companies. The testimonial list seems to go on and on. You may ask, "How does SFR stack up with other lubricants and additive companies?" Here is an eye opening independent lab test showing SFR ProTecta Vs. Competitors. My personal bicycles, tandems, cars, vans, compressors, and RV benefit from the SFR technology, something I wish I had discovered years ago. Look to SFR for your Premium Performance Oil Additives, Lubricating Oils, Synthetic Greases, Compressor Oil Additive, and Gasoline & Diesel Fuel Additive needs. Protect your investments with Superior Friction Reduction Products. SFR products have been used in industrial applications by a host of Fortune 500 Companies and also by many government agencies. Over the past several years, SFR has sold its products to major corporations such as General Motors Corp., Ford Motor Company, Honda, Samsung, British Steel, United Airlines, Frigidaire, Texaco, Chevron, Shell Oil Company, U.S. Navy, IBM, Pillsbury, and many, many more. SFR products have been proven in the field by their use in major industries. The Most Advanced Spray Lube You Can Buy! - 10 Fluid oz. Industrial grade lubricant that you can use in the house, garage and shop. In laboratory tests, ProTecta with its extreme pressure additives withstands 5 times the lubricating pressure of the leading brands. ProTecta's advanced formula provides a superior lubricating film that continues to provide protection when the oil dries. It adheres to metal better than other spray lubricants, and it cleans most surfaces and quickly penetrates and loosens frozen or rusted metal parts. Makes all other spray oils obsolete! Resists water and drives moisture from working surfaces. Evaporates leaving a protective, long lasting, non-sticky, dust-free film. Superior lubricating film strength. To clean or free stuck parts, apply liberally. ProTecta spray lube is unique in that it has three settings for adjustable spray patterns. They include Low, Medium, and High. Last Defense Against Engine Wear - 10 Fluid oz. What is ProTecta? ProTecta Engine Treatment is a new technology employing a unique patent-pending synthetic formula that forms an "intermetallic compound" during the lubricating process, that improves lubrication and protects engine parts from wear. Use with Complete Confidence and Peace of Mind. ProTecta's advanced formula is compatible with petroleum, mineral, and synthetic motor oils and oil additives. Perfect for new or older cars. Will not void new vehicle warranties. (See details of ProTecta's 8-Year/200,000 Mile Engine Warranty by clicking on the More Detail icon). Contains no chlorinated parafins, PTFE resins, "moly" or graphite as in other engine treatments. Why Use an Engine Oil Booster after using an engine treatment? Engine oil and engine treatment additives get used up and become less and less effective over time. Even metal bonding agents wear off between sliding surfaces and under pressure. It is necessary to replenish the additives to fortify your oil. ProTecta has an advanced multifunction synthetic formula that not only treats the metal but fortifies the motor oil as well. Use with Complete Confidence and Peace of Mind. 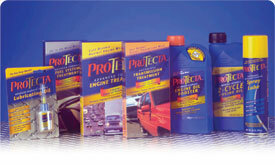 ProTecta's advanced formula is compatible with petroleum, mineral, and synthetic motor oils and oil additives. Perfect for new or older cars. Will not void new vehicle warranties. (See details of ProTecta's 8 - Year/200,000 Mile Engine Warranty by clicking on the More Detail icon). Contains no chlorinated parafins, PTFE resins, "moly" or graphite like other engine treatments. SFR Green properties: Reduces emissions, stops leaks from leaking into the environment, extend drain intervals reducing the need for more oil resources, and has improved biodegradability compared to conventional lubricants. GASZOL's advanced synthetic formulation is specifically engineered to dramatically improve the performance of all engines that use gasoline or petrol. GASZOL's leading technology, which is patent pending, does not rely on chlorinated parafins, moly, or PTFE resins. GASZOL's extreme pressure agents significantly reduce wear particle size within the engine based on wear particle analysis. For a longer lasting engine use GASZOL each time you change your oil. 3% To 4% More Mileage - 12 Fluid oz. Why Use ProTecta? No fuel treatment does more for your car than ProTecta. That's because ProTecta Fuel System Treatment is the only double-acting super concentrate on the market today. ProTecta has advanced synthetic cleaners for injectors, carburetors, and combustion chambers that clean 95% of new in only one tank full. ProTecta contains special friction modifiers that are licensed from a major oil company to provide a real mileage improvement even on new cars! The friction modifiers migrate from the fuel and into the motor oil. They work with the motor oil in the critical area on top of the pistons where only splash lubrication is present. You can expect a 3-4 % mileage improvement on new cars and even greater on older cars. With high fuel prices and the poor quality of today's fuel ProTecta is the answer for maximum efficiency. Last Defense Against Transmission Wear - 10 Fluid oz. Why Use ProTecta? For a smoother ride and a longer-lasting transmission. ProTecta will restore friction and anti-shudder control, reduce sludge and formation deposits, and improve wear protection. The cause of transmission torque converter shudder is the sticking of the transmission fluid. ProTecta keeps working when factory fluids have lost their effectiveness. 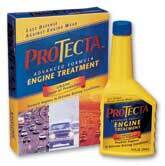 ProTecta enhances the fluid life with synthetic formulation for maximum transmission performance. Protect Your Investment! Extend the Life of Your Automatic Transmission. D-SOL's advanced synthetic formulation is specifically engineered to dramatically improve the performance of all diesel engines. D-SOL's leading technology, which is patent pending, does not rely on chlorinated parafins, moly, or PTFE resins. D-SOL fortifies motor oil with concentrated extreme pressure agents, detergent/dispersants, anti-wear agents, corrosion inhibitors, anti-oxidants, pour point depressants, and anti-foaming agents. GEARZOL with its advanced synthetic formulation was engineered not only for industrial gears but for automotive applications as well. GEARZOL dramatically improves the operating performance of industrial closed gear drives as well as automotive final drives, manual transmissions, and transaxles of trucks, buses, and cars. D-SOL Diesel Fuel Conditioner Lubricity/Cetane improver formula is an advanced fuel additive that overcomes problems associated with the new low sulfur and poor quality fuels. Many operators of diesel equipment have seen the costs of running and repairing their engines escalate. D-SOL Lubricity/Cetane Improver Fuel Conditioner helps contain those costs by improving fuel economy, cleaning injectors and reducing the need for repairs. There are a lot of diesel pick-up tuck owners in the U.S. and with fuel pumps failing prematurely due to the low sulfur fuel, owners should consider using D-SOL for improving longevity of pumps and injectors. D-SOL Multi-Functional Diesel Fuel Conditioner is designed for usage all year as a premium state of the art fuel conditioner, but is outstanding in winter conditions. In winter driving conditions operating temperatures are not the same as summer and it requires additional additives not only for anti-gelling, but for corrosion, cleaning due to added deposits and a de-icer to prevent filter plugging. For exceptional results discover D-SOL Multi-Functional Fuel Conditioner. SFR 2522 Grease is fortified with the same specialized extreme-pressure additives used in SFR 100. It contains moly and utilizes a Lithium complex Soap that has a high resistance to softening and removal by water. Because of its tremendous resistance to consistency change, SFR 2522 Grease displays excellent mechanical stability and can be used in a wide range of industrial and chassis applications. Or Call Us at 913-962-8866 CT 10 a.m. - 9 p.m. Please leave a message if we are unavailable.